Sinter smelting is the use of a variety of heating methods (such as arc, electron beam, plasma, etc.) in vacuum conditions, a layer of solid shell solidified by a metal melt between the water-cooled copper crucible and the metal melt Melting metal case. The furnace is a horizontal structure composed of a furnace body, an electrode lifting system, a hydraulic system, a melting crucible system (water-cooled copper crucible, arc stabilizing device, pouring and collecting device), a strong cooling circulation system, a vacuum system, a water cooling system, System, electronic control system and other components. Centrifugal disk adopts frequency conversion and speed control system to precisely control the speed. Electrode feed adopts servo motor control and advanced adjustment control adaptive technology. Computer controlled image monitoring system is safe and reliable. 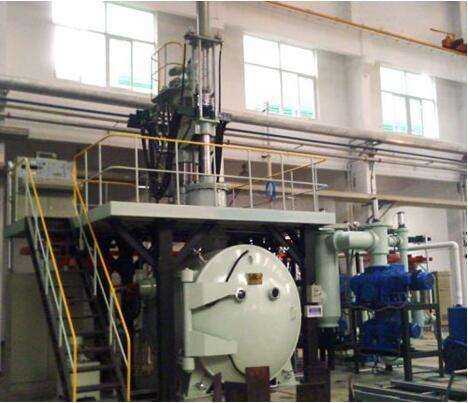 Horizontal furnace with front and rear door set, two each have a crucible can work alternately to improve efficiency, while solving the existing coagulation furnace loading and unloading cleaning crucible difficulties.